Craignethan Castle is an interesting fortified building, located in South Lanarkshire in Scotland. It was erected at a strategic location around the River Nethan, a tributary of the larger River Clyde. Fortress Craignethan, which is now buried in the ruins is located about two miles west of the village Crossford and 4.5 miles northwest of Lanark. Territories around Craignethan were still inhabited in ancient times, as former Roman settlement has been located. In the form in which the castle was able to store up to today, it was built in the 16th century. In 1532 it was an excellent example of an early artillery fortress, although its defensive fortifications did not take much in use at that time. What distinguishes Craignethan from any other defenses is that it had recently built such a fortress in Scotland. Craignethan Castle was built on a secure site, over the turn of the river Nethan. Steep slopes, protect the fortress from the south, north and east, but in practice is open from the west side, making it more vulnerable than it appears. That is why the west side of Craignethan Castle to is protected with watchtowers. The castle itself was built on the square architectural plan, with relatively low grade firewalls. The west side is marked by a large moat, followed by an extensive patio. Inside the main building with measures 21 to 16 meters was originally built on two floors plus an attic. The roof and ceiling are destroyed today, but the main walls stay in place. In the main entrance into the large hall on the first floor below them are several dungeons and prisons. 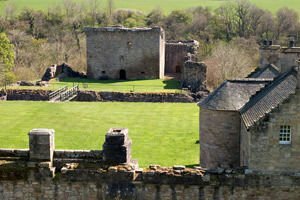 The courtyard of the Craignethan Castle measures 49 meters to 25 meters, and the outside walls are reinforced by rectangular towers at each corner. The western fence is designed to withstand artillery bombardment and reaches 5 meters thick. The firewalls enter through an entrance located on the northern part of the fort.